Early Florida Primary Could Sow Confusion, Not Clout As in 2008, Florida is breaking GOP rules to hold a winner-take-all primary in January. But this time the decision could confuse the race: If the nomination fight is close, any Florida Republican voter could challenge the delegate count at next year's convention. 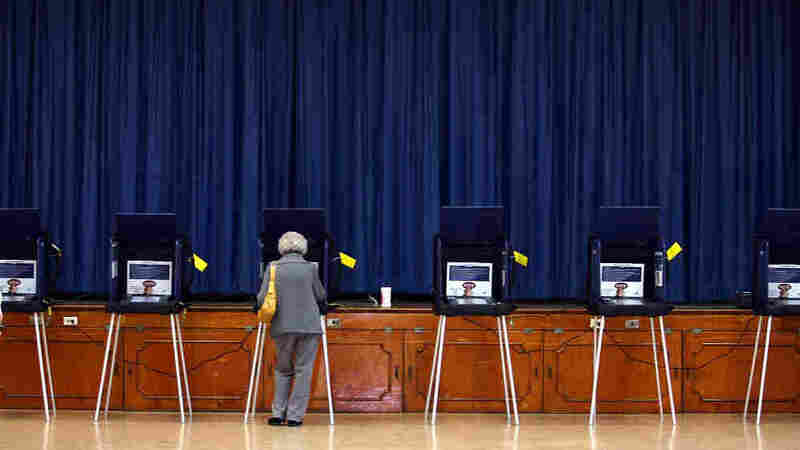 A woman votes in the Jan. 29, 2008, Florida primary in Miami Shores. Four years ago, Florida played a key role choosing the Republican presidential nominee with a crucial early primary in violation of party rules. Next month, Florida Republicans are poised to do it again — once again breaking rules with an early primary. Only this time, their decision could confuse the race, rather than clarify it. To understand why political parties set rules for presidential primaries, and why states break those rules, it's helpful to appreciate what it means for the campaigns to descend on a small state like Iowa or New Hampshire. Beyond the glad-handing and ring-kissing of retail politics, there's also the sound of money. Millions of dollars are spent at restaurants, on campaign workers, and radio and television advertising — all injected into the local economy. When mega-state Florida moved its primary date to Jan. 31 to increase its influence, it forced South Carolina and other official early states to move even earlier in January to preserve their place in line. "No candidate's going to ignore Florida, no matter what," says South Carolina Republican Party Chairman Chad Connelly. "And so their whole premise of compressing the calendar and creating this chaos was that they want to be more relevant. I thought that was just silly. They already are relevant." When it comes to flouting primary rules, Florida is a repeat offender. Winner-take-all kind of short-changes [the] process. It can make a front-runner become the inevitable nominee more quickly than ... the party is ready for him to win. When the state did this last time, in 2008, Arizona Sen. John McCain was the beneficiary. It was a winner-take-all contest, which gave McCain all of the state's GOP delegates, even though he barely won a third of the votes cast. The second- and third-place finishers got nothing. McCain's win triggered his even-bigger delegate haul a week later on Super Tuesday, which featured many similar winner-take-all events. In effect, McCain locked up the nomination that night. McCain couldn't carry Florida and lost decisively to Barack Obama. Many conservatives blamed that compressed schedule packed with winner-take-all contests — the exact opposite of the proportional primaries on the Democratic side that drew out Obama's race against Hillary Clinton into early summer. "Winner-take-all kind of short-changes that process. It can make a front-runner become the inevitable nominee more quickly than ... the party is ready for him to win," says Rob Ritchie, who heads the elections reform group FairVote.org. Enter the Republican National Committee, which in 2010 wrote a new rule to slow things down. The early states — Iowa, New Hampshire, Nevada, South Carolina — would not vote until February. The other states could start March 6, but only if they awarded delegates proportionally, limiting their influence. States that wanted winner-take-all had to wait until April 1. Rule-breaking states would lose half of their delegates. But Florida saw no use for that schedule. "We ought to go early and we ought to be by ourselves so that our voice has a much larger impact due to the size and the diversity of our state," says Florida GOP Chairman Lenny Curry. Just as in 2008, Iowa, New Hampshire and South Carolina all moved their dates to stay ahead of Florida. But Florida did something else the others did not: insisting, despite the new rule, on winner-take-all. It's that second violation that really has Connelly livid, because the rules do not automatically impose any additional penalty. "So they need to lose all the delegates, or they need to be proportionally allocated — something that makes them go: 'Wow, we don't want to do to this,'" he says. That's not likely to happen. Party officials and observers believe Florida — the host for next summer's GOP convention — will escape any further consequence. That is unless the Republican race winds up close and the delegate count actually starts to matter. Come summer, party rules allow any Republican voter in Florida to challenge the state's winner-take-all scheme at the Tampa convention, potentially complicating and confusing the nomination itself. "Let's suppose that a person supporting say Ron Paul ... says, 'Look, my candidate was entitled to 10 percent of the 50 delegates. We're entitled to five delegates. And I'm going to file a challenge asserting that we get our five delegates.' I think that's a very plausible scenario," says John Ryder, an RNC member from Tennessee who was on the committee that wrote the latest rules. And that possibility, Ryder thinks, could dramatically lessen the momentum and media value of winning next month's Florida primary. "Anybody reporting the results from Florida would have to award the delegates won on their Jan. 31 primary with an asterisk, and say: 'But, it could be subject to a challenge,'" Ryder says. In other words, Florida could find itself making much less of a difference than if it had simply followed the rules.